In the past 12 months, we reached an all-time high (once again) right before getting hit by a quick storm that ended on Christmas Eve. In an ideal world, we would go cash a few weeks before the market crashes and then jump back in when the market is at its bottom. But going cash will always be a poor strategy, because cash doesn’t earn much, provides you with a surreal sentiment of security and being cash can keep you in an eternal dilemma. A solid investing plan would start with well-researched rules. Then, those rules would not only include how to pick stocks but would also cover how you will manage your portfolio going forward. The past 12 months have been quite interesting, to say the least. We reached an all-time high (once again) right before getting hit by a quick storm that ended on Christmas Eve. As we are about to enter the second earnings season of the year, the first to report 2019 numbers, it's time to look at our portfolios. What do you do now? This question seems simple, and yet, the answer is quite complex. Some others will tell you about the next market crash; prepare for winter. #1 - Being 100% invested. #2 - Keeping 30% cash for the next crash. #3 - Keeping 50% cash for the next crash. The 100% invested approach was the best strategy. I never thought of writing that, but sometimes doing nothing is what gets the most done! By letting my dividend growth stocks work for me, I only needed 15 months to build enough profit that a 20% market drop wasn't enough to hurt my portfolio. I finished 2018 with a great +5.5% while doing nothing. Then, my portfolio was ready to enjoy the full market recovery in early 2019. First, cash doesn't earn much. At best, you simply keep your money on par with inflation. At worst, you have a little less buying power each month that goes by. Second, cash provides you with a surreal sentiment of security. While you are cash, you think that everything is fine. Far from it. Unless you are very ahead with your retirement plan (e.g., you are sitting on millions, while you need pennies to live), you are seriously amputating your future by staying cash. 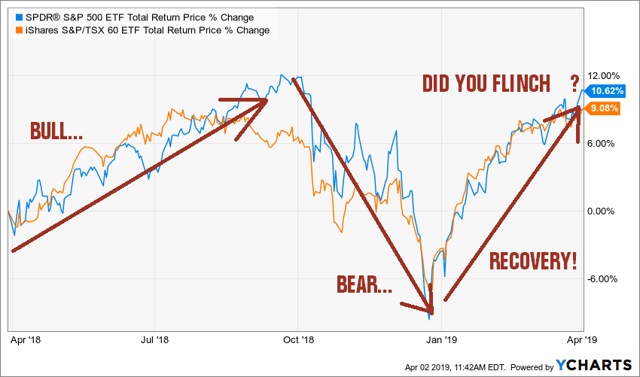 While you keep your eye on "the money you don't lose" (if you ever get it right and avoid a correction), you forget about "the money you don't make" as the market keeps going up. You don't believe me? Just make the calculations on what you left on the table since you went cash in the past 10 years. Unless you cashed your money last summer, you are losing big time. If you were lucky enough to sell last summer, you are now exactly at the same point. Therefore, you haven't avoided anything. You just bought a few good nights of sleep. Third, and this is probably the most important point, being cash can keep you in an eternal dilemma. Let's wait a few more months to see how it goes. Each day passes and you still wonder what's happening on the market. If it goes up too fast, you will expect another drop. If it keeps dropping, you will patiently wait until there is a clear sign of recovery. So tell me, what we just went through in the past 3 months, was it just a small bump before the real crash or is it a clear sign of recovery? I really don't have the answer to that question, do you? Therefore, if you are thinking of selling your portfolio now that we have reached another peak value, you are wrong. What you can do, on the other hand, is to prepare for winter. If there is one point I can't disagree with all the bear lovers around is that we are closer to a market correction than another 10-year bull ride. Technically, you have greater chances of calling a rainy day after 10 days of continuous sun and blue sky, right? But timing the market, calling the drop and going cash aren't part of my 7 dividend investing principles. I rather prepare my portfolio for a challenging time by becoming a more demanding investor. First, I got rid of all my "play money trades". You know, those companies you buy because you have a "hunch" or because you think there is a good chance the stock will recover? I usually allow between 5% and 10% of my portfolio for stocks that don't meet my investing requirements. As the market is getting volatile and difficult to read, I got rid of all of those right before the summer of 2018. I didn't call the market drop, I simply put stop sells on those trades and they were triggered! I used that money to buy solid dividend growers instead. Review my portfolio to ensure all companies will keep their dividend well and alive. Make sure all stocks show strong growth vectors. A solid investing plan would start with well-researched rules. Then, those rules would not only include how to pick stocks but would also cover how you will manage your portfolio going forward. It's easy to pick stocks from the Dividend Achievers list and feel comfortable. But you must go further when designing your investing plan. This is the foundation of your house, not just a kid's drawing on your refrigerator's door. You plan should include your asset allocation and then your sector allocation. It should determine a specific approach to invest your money in time. This plan must provide a clear answer as to when and why you should buy or sell stocks. It's easier to stick to a plan if it includes all of the above. Mine does, and it makes my life so much easier. Whenever I have a question, all I have to do is to go back to my plan and read what was already determined for that situation. Most of the time, I end up doing nothing. Isn't the goal of investing in dividend stocks? Creating a passive income?